Where Do You Draw the Line? Who Else Can the Government Bailout? California. Yesterday, California announced that it may need a $7 billion emergency loan from the federal government. According to Census Bureau data California is responsible for 13% of the United States’ gross domestic product (GDP). The GDP of the United States was approximately $13.8 trillion in 2006, the last set of data available. That would put California’s GDP at $1.8 trillion on its own. California’s economy is 12th largest economy in the world, larger than countries such as Mexico, Russia, India, Australia, and South Korea. Amtrak. This week, the Bush administration will increase the nation’s passenger rail service doubling Amtrak funding to $13 billion over five years. Since 1971, the American tax payers have continuously bailed out the passenger rail service through federal government subsidies. 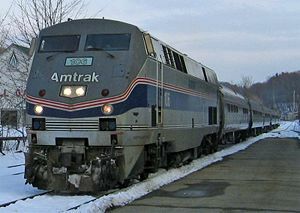 Amtrak’s preferred stock is owned by the federal government, and its board of directors is appointed by the President of the United States and subject to confirmation by the United States Senate. Amtrak received over $1 billion every year from the federal government in order to continue operations. Despite a Congressional mandate to become self-sufficient, Amtrak continues to operate in the red. Big Auto. Before the monumental $700 billion bailout plan for the American economy was jammed down the throats of the American tax payers, Congress passed a small, quiet $25 billion worth of bailout loans to the auto industry at below-market prices. The deal allows the car makers to borrow money at about half the current market rate. Rough life! I’d love to buy my house this winter at 3% instead of the going 30-year fixed rate of about 6%. This bill is on top of the $25 billion loan Washington made the automobile industry last year. The top three automakers, Chrysler, Ford Motor and General Motors, do not have to repay the new loans just signed by the President for five years. America is addicted to debt, and the federal government is no different. Congress and the President continue to bailout large industries and companies in America by increasing the national debt. It is ironic that we are rescuing banks that are in trouble because of bad mortgage debt by increasing the national debt. Re: Amtrak – It’s much the same in Canada, with some of our railways being Crown corporations. Have they EVER made a profit? But then again, railways are expensive, and what would we do without them?